How many landowners has Sabal Trail sent final notices like this? Update 2015-03-23: Added transcription; see more background here and you can write to the Clerk of Superior Court in Leesburg, GA against a possible summary judgement for surveying eminent domain in a hearing Tuesday morning 11:30 AM March 24th 2015. 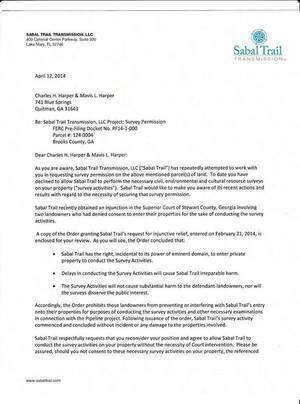 It is imperative that Sabal Trail begin performing the remaining surveys. Please consider this letter as Sabal Trail’s final request for permission to conduct the surveys on a portion of your property…. Please note that Georgia statute O.C.G.A. 22-3-88, sets forth survey authority as related to this Project which has been affirmed in Georgia Court. Imperative for a company from Houston to profit by gouging through local land and under our rivers and maybe into our aquifer. Not imperative for those of us who live here. Why would a pipeline company from Houston suffer irreparable harm if it couldn’t go onto the land of somebody in Georgia? 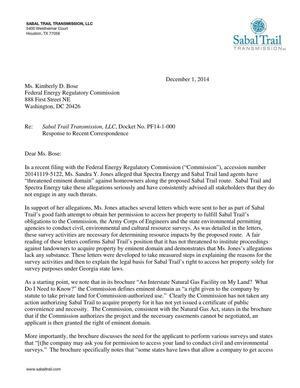 A judge in one Georgia county bought Sabal Trail’s eminent domain assertions and now Sabal Trail is citing that to try to get a landowner in Brooks County to let it on the property to survey for its fracked methane pipeline. What about private property rights? Sabal Trail has the right, incidental to its power of eminent domain, to enter private property to conduct the Survey Activities. 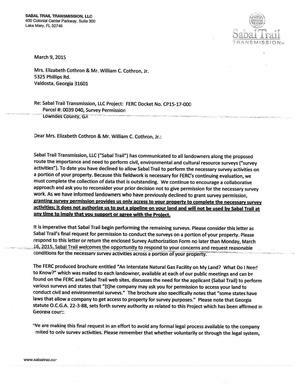 Delays in conducting the Survey Activities will cause Sabal Trail irreparable harm. The Survey Activities will not cause substantial harm to the defendant landowners, nor will the surveys disserve the public interest.